You may find it necessary to "reset" your Sony car stereo at some point. This sometimes happens if you've had to replace the battery or otherwise disconnect the player from its power source--suddenly the player may lock up or become unresponsive. Resetting the stereo isn't a hard job and doesn't require any special tools. Turn the power off to the stereo with the "on/off" or "power" button on the upper left of the faceplate of the stereo. Hold the button in until the power turns off. Remove the faceplate by pressing the "Open" button on the upper right of the faceplate. When it folds down, pull on the left side of the panel to release it. Use a ballpoint pen to press the "reset" button. The button will be on the lower left side of the stereo (see the illustration). Reverse the procedure you used to remove the faceplate to put it back on. Press the power button to turn the stereo back on and test operation. You'll need to reenter any user settings, such as radio presets. 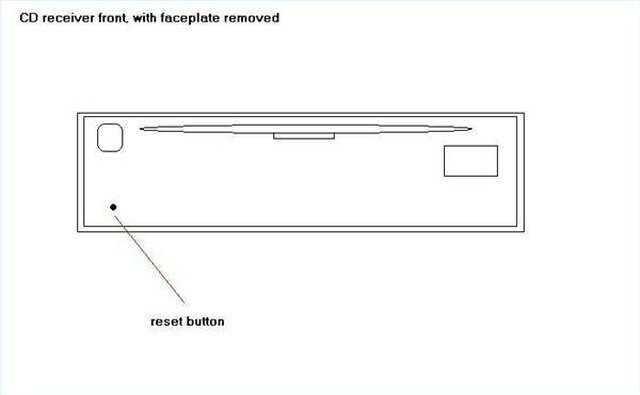 If the stereo doesn't work properly, try the reset process once more. If you're still unsuccessful, consult your Sony car stereo's manual for information on service, or go to Sony's eservice center (see Resources).